Is ‘Spring Breakers’ Worthy of the Hate? Does It Require a Defense? Come on, what are we really talking about here? For anyone wondering why Spring Breakers is doing so well in theaters you only need to look at that image above. After premiering in three theaters two weeks ago and racking up $87,667 per screen and ultimately pulling in approximately $5 million this past weekend as it expanded to 1,104 theaters many are looking for answers or at least a chance to be part of the conversation, which brings me to the Huffington Post Live (via HE) video at the bottom of this post. MSN’s Glenn Kenny and Huffington’s Chris Rosen discuss the film with moderator Ricky Camilleri accompanied by a brief interjection from The Inquisitir‘s Niki Cruz and an ultimate takeover by director William Friedkin, but when you start hearing Spring Breakers in the same sentences as films such as The Master and ultimately A Clockwork Orange, I can’t help but sit back and laugh along with Kenny and Rosen. How high is the bar we are using to judge new films if Spring Breakers is considered worthy of comparison to either of those films? Either way, considering those films are even being mentioned, it gives good reason as to why audiences are reacting so unfavorably to what they are seeing. At one point in the conversation a comparison of the Spring Breakers marketing is made to Nicolas Winding Refn‘s Drive. Like Rosen says in the video, the marketing for Drive made it look like a Fast and the Furious film rather than the art house film it was. 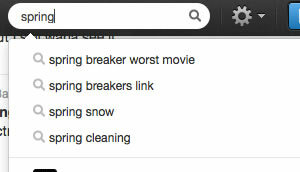 Spring Breakers is marketed with the same confusion and audiences are reacting much the same way. Last year, Killing Them Softly was equally slain after people went to theaters searching for a Brad Pitt-led gangster film only to find an allegorical feature on America and capitalism that ultimately received an “F” CinemaScore from opening day audiences. A CinemaScore for Spring Breakers is not yet in, but Kenny mentions a Twitter hashtag that was making the rounds over the weekend citing the film as the worst movie ever. Calum Marsh at Film.com has already delved into those reactions, but he’s also one of the critics that found ways to mine his thesaurus in reviewing the film from the Toronto Film Festival last year. Marsh found meaning where I found a theme that got lost in its own gloss and nose candy, but that’s beside the point. Spring breakers. The worst movie in theaters right now. Why these reactions? Well, for the account that has Selena Gomez as their icon, yeah, that is anything but the audience that should be checking this movie out. However, beyond the fact it was sold as a wild spring break film when that angle is more a thematic interlude than anything else, as I wrote in my review, it’s “more of an exploitation feature than anything else and at the same time rather experimental.” Yeah, “experimental”, just what the kids ordered eh? I called it a “a theatrical rave experience minus the glow sticks and ecstasy,” largely due to the unhinged nature of it all, but in the end it’s that tinge of art house driving the narrative structure that’s going to turn general audiences off, ultimately landing it cult status down the road. Admittedly, I’ve only seen the film once and, perhaps, with an attempt at a fresh approach more of it may come together. That said, I can respect what director Harmony Korine has accomplished, but at this time I would never put it up against the likes of The Master or A Clockwork Orange or any of Friedkin’s films such as The Exorcist and The French Connection, though a Killer Joe comparison may be apt. As for the back-and-forth below, definitely give it a watch. It runs just about 23 minutes long and I had no problem sticking with the entire conversation, though someone over at HuffPo needs to tell people to stop opening squeaky doors while they’re recording. That or buy some WD-40.